It's always a welcome thing to learn that ideas that are commonplace in science fiction have a basis in science fact. Cryogenic freezers, laser guns, robots, silicate implants… and let's not forget the warp drive! 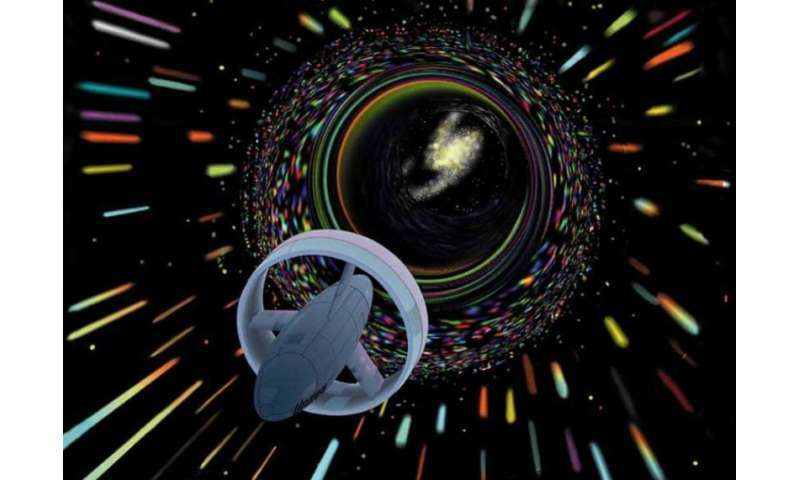 Believe it or not, this concept – alternately known as FTL (Faster-Than-Light) travel, Hyperspace, Lightspeed, etc. – actually has one foot in the world of real science. In physics, it is what is known as the Alcubierre Warp Drive. On paper, it is a highly speculative, but possibly valid, solution of the Einstein field equations, specifically how space, time and energy interact. In this particular mathematical model of spacetime, there are features that are apparently reminiscent of the fictional "warp drive" or "hyperspace" from notable science fiction franchises, hence the association. Since Einstein first proposed the Special Theory of Relativity in 1905, scientists have been operating under the restrictions imposed by a relativistic universe. One of these restrictions is the belief that the speed of light is unbreakable and hence, that there will never be such a thing as FTL space travel or exploration. Even though subsequent generations of scientists and engineers managed to break the sound barrier and defeat the pull of the Earth's gravity, the speed of light appeared to be one barrier that was destined to hold. But then, in 1994, a Mexican physicist by the name of Miguel Alcubierre came along with proposed method for stretching the fabric of space-time in way which would, in theory, allow FTL travel to take pace. To put it simply, this method of space travel involves stretching the fabric of space-time in a wave which would (in theory) cause the space ahead of an object to contract while the space behind it would expand. An object inside this wave (i.e. a spaceship) would then be able to ride this region, known as a "warp bubble" of flat space. This is what is known as the "Alcubierre Metric". Interpreted in the context of General Relativity, the metric allows a warp bubble to appear in a previously flat region of spacetime and move away, effectively at speeds that exceed the speed of light. The interior of the bubble is the inertial reference frame for any object inhabiting it. Since the ship is not moving within this bubble, but is being carried along as the region itself moves, conventional relativistic effects such as time dilation would not apply. Hence, the rules of space-time and the laws of relativity would not be violated in the conventional sense. One of the reasons for this is because this method would not rely on moving faster than light in the local sense, since a light beam within this bubble would still always move faster than the ship. It is only "faster than light" in the sense that the ship could reach its destination faster than a beam of light that was traveling outside the warp bubble. However, there is are few problems with this theory. For one, there are no known methods to create such a warp bubble in a region of space that would not already contain one. Second, assuming there was a way to create such a bubble, there is not yet any known way of leaving once inside it. As a result, the Alcubierre drive (or metric) remains in the category of theory at this time. Mathematically, it can be represented by the following equation: ds2= – (a2 – BiBi) dt2 + 2Bi dxi dt + gijdxi dxj, where a is the lapse function that gives the interval of proper time between nearby hypersurfaces, Bi is the shift vector that relates the spatial coordinate systems on different hypersurfaces and gij is a positive definite metric on each of the hypersurfaces. In 1996, NASA founded a research project known as the Breakthrough Propulsion Physics Project (BPP) to study various spacecraft proposals and technologies. In 2002, the project's funding was discontinued, which prompted the founder – Marc G. Millis – and several members to create the Tau Zero Foundation. Named after the famous novel of the same name by Poul Anderson, this organization is dedicated to researching interstellar travel. In 2012, NASA's Advanced Propulsion Physics Laboratory (aka. Eagleworks) announced that they had began conducting experiments to see if a "warp drive" was in fact possible. This included developing an interferometer to detect the spatial distortions produced by the expanding and contracting space-time of the Alcubierre metric. "We've initiated an interferometer test bed in this lab, where we're going to go through and try and generate a microscopic instance of a little warp bubble. And although this is just a microscopic instance of the phenomena, we're perturbing space time, one part in 10 million, a very tiny amount… The math would allow you to go to Alpha Centauri in two weeks as measured by clocks here on Earth. So somebody's clock onboard the spacecraft has the same rate of time as somebody in mission control here in Houston might have. There are no tidal forces, no undue issues, and the proper acceleration is zero. When you turn the field on, everybody doesn't go slamming against the bulkhead, (which) would be a very short and sad trip." In 2013, Dr. White and members of Eagleworks published the results of their 19.6-second warp field test under vacuum conditions. These results, which were deemed to be inconclusive, were presented at the 2013 Icarus Interstellar Starship Congress held in Dallas, Texas. When it comes to the future of space exploration, some very tough questions seem unavoidable. And questions like "long will it take us to get the nearest star?" seem rather troubling when we don't make allowances for some kind of hypervelocity or faster-than-light transit method. How can we expect to become an interstellar species when all available methods with either take centuries (or longer), or will involve sending a nanocraft instead? At present, such a thing just doesn't seem to be entirely within the realm of possibility. And attempts to prove otherwise remain unsuccessful or inconclusive. But as history has taught us, what is considered to be impossible changes over time. Someday, who knows what we might be able to accomplish? But until then, we'll just have to be patient and wait on future research. Probing Question: Can anything travel faster than the speed of light? A much simpler possiblity is if we find that anti-matter repulses normal matter (so far not proven). You build a probe out of anti-matter and it will accelerate away from the Sun. When it gets to its destination , it will slow down again. As it is propelled by gravity the mass should cancel out in the equations meaning there is no limit to how fast it can go. So far all unproven but we should know what is happening after the Alpha project at CERN gives it s result in the next few years. Probably could be used more practically for communications than human transport or spaceships.